You can't make money online without an audience, and search engine optimization can bring millions of people to your website. There are all sorts of ways to make money from a blog or website. You could sell ads, write sponsored content or work with content partners. You could create an online shop or use affiliate links to send your readers to someone else’s online shop. You could even create a subscription model, where readers need to pay to view your content. However, none of those strategies are going to work if you don’t have a consistent flow of people coming to your site. That’s why the first step in making money from your blog or website is building an audience. That’s where search engine optimization (SEO) comes in. Any time you google something, Google’s algorithm works to choose stories and posts that will answer your question. SEO is all about understanding those algorithms. That way, when someone googles something that applies to your website or blog, they won’t have to dig through several pages of results to find yours. It'll be right at the top. Now, whenever anyone searches for “How to Start a Business,” they find my article in the top spot. According to Google, I am the top authority on starting a business. Not Bill Gates. Not Elon Musk. A former English major in his mid-20s with no business background is ranked ahead of Gary Vaynerchuk, Oprah Winfrey -- everyone. Now, there are a lot of things that went into that top ranking, which I’ll do my best to explain in this article. But, before I do that, let’s address one broader question first. How much does being ranked highly on Google really matter? You might think that using social media is the best way to get your blog or website seen. I don’t want to discount them. Facebook, Twitter, Instagram and all the rest can be powerful tools to help you build a following. Google is the highest-trafficked website in the world. Even getting a fraction of Google’s traffic is significant for your website. Optimized content can stay in the top spot for as long as it’s relevant. A Facebook post shows up in a feed for a couple of hours. One tweet might be skipped over. But a top-ranked Google post can last for months or even years. For example, I wrote my “How to Start a Business” post in October, and it’s No. 1 eight months later. You just can’t get that on social media. Even if you use a pinned post, you only get one. There’s no limit on how many top-ranked Google articles you can write. So, now we know what SEO is and why it’s important. But, how do we actually optimize our content? How do we make online content that appears on the first page of Google, Bing and other search engines? 1. Before you write your post, make sure your site is optimized. Search engines care about more than just the words on the page. They also take into account factors including the quality and consistency of your site speed and authority. There are tons of other factors that go into website SEO, but let’s break down these two. There are a ton of reasons why you should want your website to run as fast as possible. Web users are notoriously impatient, and they’re liable to leave your website -- maybe forever -- if it takes just two seconds to load. At the same time, improving website speed can lead to an increase in conversions, downloads and views. Entrepreneur contributor Thomas Smale has two great strategies you can use to improve your website’s speed. Odds are, you can probably make your image files much smaller without sacrificing quality. For example, there’s no need to upload a 5,000 pixel by 5,000 pixel image in a box that’s only a 500 pixel square. That image is 100 times bigger than it needs to be, and it could be the difference between a fast loading site and a slow one. You should also think about the density of your image. Most computer screens only show images at 72 pixels per inch (ppi), which means that anything clearer than that is wasted -- like watching a high-definition Blu Ray movie on an old TV. So, even if your image is a 500 pixel square, you should check the ppi to make sure it is set at 72. Often, images are set at 300 ppi, which makes your image file four times larger than it needs to be without improving the quality. There are all sorts of things you can do to improve your mobile performance. For example, if you are building your own website, you could implement Accelerated Mobile Pages to simplify your mobile pages and speed things up. If you are using one of the popular web-hosting sites for your website, you should check to see how that host performs on mobile. Entrepreneur contributor Segun Onibalusi found that Duda performed better on mobile than WordPress, Wix or Weebly, but you should do your own research to find which one works best for your content. Authority comes from different sources -- users, other websites and search engines -- but really, it comes down to trust. How long has your website been relevant, and how long have you been creating content around a given topic? Just as important, do other experts use your website as a source? Are they linking to it or citing you? For example, Entrepreneur has released its online list of top 500 franchises each year since 2001. We break down each of the businesses -- why they made the list, the company history and more. We’re not just the top search result -- we own four of the top five places. We are the authority on cheap franchises. But, that doesn’t mean we’re the authority on everything. There are a lot of topics that we don’t cover at Entrepreneur. For example, if we wrote an article about the World Cup, we wouldn’t expect to outrank ESPN or FOX Sports. Those sites cover soccer every day. In the same way, you can carve out your own niche on Google. The more general you are, the more likely you are to encounter a website with more authority than yours who has written on the same topic. But, if you can create content specific for one audience, you can avoid the behemoths in your industry and find your way to the top spot on Google. Recently, This Dog’s Life published an article titled “8 of the Most Dog-Friendly Offices of 2018.” Now, if you were to google “Dog-Friendly Offices,” you wouldn’t find the story from This Dog’s Life. The top spot would be taken by an article by a much larger website, Fortune. Note the date on that article -- it was published in March of 2016. It’s a good example of how long a top Google result can last. For the past two years, people wanting to learn about dog-friendly offices have been going to Fortune to read that article. Fortune’s article also provided an opportunity for This Dog’s Life. Since it’s from 2016, it’s possible that those suggestions could be outdated. 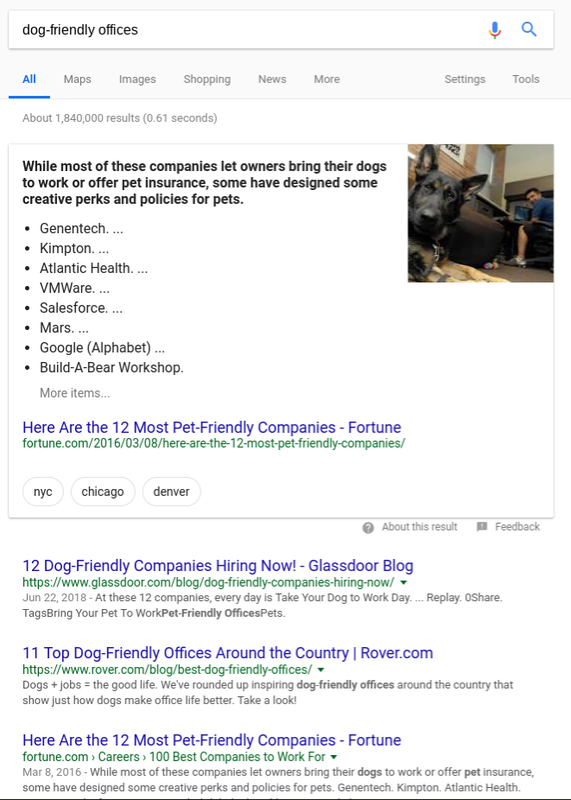 Dog lovers might instead choose to search for something more specific, like “Dog-Friendly Offices in 2018.” And guess who’s on the first page for that search, ahead of the Fortune article? Just this little bit of specificity allowed This Dog’s Life to rank on the first page on Google -- even reaching No. 1 for a time. 2. While writing your post, you should have a keyword or search term in mind. Google isn’t going to magically rank your website in the top 10 just because you write a post. You have to help search engines out by predicting what people will search to find your story. For example, let’s say I write an article for Entrepreneur about what kids need to run their own lemonade stand. And if someone read my article in a print newspaper, they might see a picture of a lemonade stand or read a little of the story and figure out what it’s about. But no one on the internet is searching for terms like “Lemonaid” or “Sugar, Water and Lemons.” They might search for “How to Be Beyonce,” but they’re not going to want a story about lemonade stands as an answer. What Ingredients Do You Need to Run a Lemonade Stand? A Checklist. These titles are more straightforward, and they mirror the way a potential user would search for information on lemonade stands. That’s important. The key search term in each of my titles is “Run a Lemonade Stand,” because I want people to find my article when they search for information on running a lemonade stand. When picking your own keyword, you should try to think about how people would search for the information you’re offering. Related: What Exactly Is SEO? Once you pick your key search term, you have to use it in the post. Putting the keyword in the headline is important, but it isn’t the only thing you should do to optimize your story. You should also include your keyword throughout the story, including in your intro and in a "heading 2," or H2, tag somewhere in the piece. One potential way to add keywords is through the use of related links -- by adding related links with similar titles, you can add keywords without actually changing the content of your article. 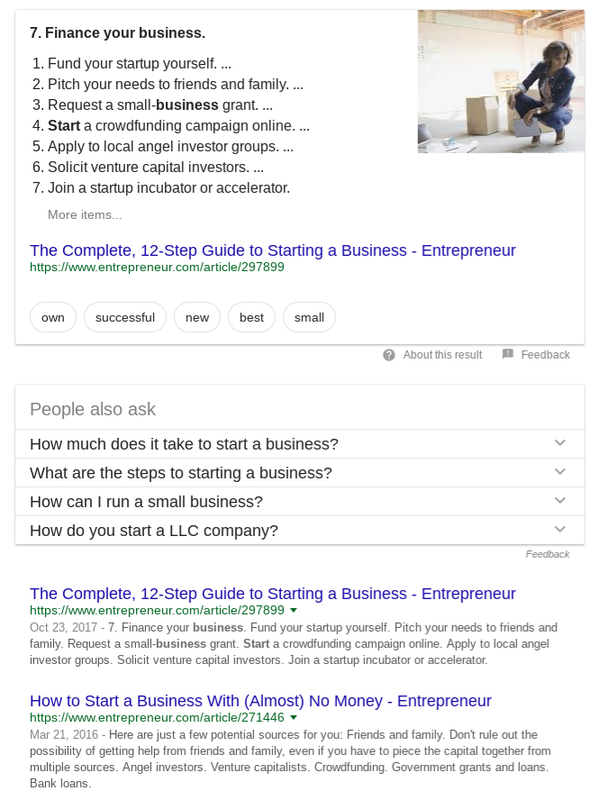 In my story on “How to Start a Business,” I added a link to a story about “How to Start a Business Online.” That story is more specific than mine, because it only relates to online businesses, but it still contains the keywords I used. Use internal links to other stories on related topics from your website. For example, I might add a link in my lemonade stand story to an article about kid entrepreneurs or how parents can make extra money for college. If you have the budget, online tools such as Searchmetrics or Brightedge can help you identify how often you should use your keyword in the article, as well as additional keywords that you should include in your article. If you don’t, that’s OK. Just try to use your keyword or search term as much as you can without going overboard. You should still write like you’re talking to people and not a machine. Search engines penalize short articles (think less than 300 words) that jam in keywords without saying anything. Google and others prefer longer articles. Depending on the subject matter, what “longer” actually means can vary. For an article on lemonade stands, 700 words might be longer than average. For an article on how to start a business, search engines might demand something closer to 4,000. This is another difference between writing for search engine optimization and writing for a newspaper. In a newspaper, every word is taking up physical space on the page. Every unnecessary word is literally a waste of space. Online, it’s worth taking the time to make sure you’re clear, even if it takes a few extra words. You should also write in an approachable way. Try not to get too in the weeds, even if you’re talking about something technical. If you write with easy-to-read prose, search engines will be more likely to rank your story well and, more importantly, your readers will appreciate it. 3. After writing your post, you have to share it. And you need to get other people to share it, too. It’s pretty simple: If people share your article, it means they think other people should see it. Isn’t that the whole point of a search engine -- pointing people to the posts, websites and information they should see? In the same way that you might be more likely to buy a product or service after someone recommends it, Google and other search engines are more likely to commit to your page after others have shared it. Rely on your own social network. Rely on a partner’s social network. Belanger shared the story on her Twitter account with 4,500 followers, which is already a good start. But then, the article got more firepower behind it when it was shared by Entrepreneur’s official Twitter and Facebook accounts, which have about 3.4 million followers each. Plus, Marie put the article in an Instagram story, tapping into her 3.7 million followers. By tapping into all of those sources, Belanger’s story was shared by accounts with more than 10 million combined followers. To put that in perspective, Bill Gates’s Instagram account has about 1.7 million followers. There are many ways you can create partners who will share your content. You could do what Belanger did and interview someone with a big social following. You could agree to swap stories with other websites or blogs in your industry, where you share their stories and they share yours. You could create Facebook Groups with like-minded people who will want to read and share your work. But, it’s also important to grow your own social following. That way, you don’t have to rely on others’ participation. You can start the conversation that gets you recognized on Google. Develop a multichannel approach. You never know which social media channel will be in favor in a few years. If you have the resources to do so, it never hurts to establish a presence on multiple platforms. Invest in influencer marketing. These don’t necessarily have to be long-term partnerships, but influencers can help you connect with your target audience. Engage commenters as quickly as possible. Facebook and Instagram use “engagement” as a primary factor in their algorithms for determining what to show their users. If you can respond to your followers quickly, they’re more likely to engage with your content. Amplify reach through look-alike audiences. Consider using paid social media marketing once you’ve established a clear strategy. Measure strategy success through on-platform and on-site measurement. Analytics are your friend. Use the tools available to you from Facebook Insights, Twitter Analytics and more to figure out what’s working and what’s not. Create a clear and unique brand identity. We’ve already gone over how it’s important to carve out a niche for search engine optimization. The same holds true for your social brand. Social networks are crowded, and you don’t want to be a second-rate version of someone else. Find creative ways to delight people. According to Patel, the average person shares a positive customer service experience with nine other people. So, if you can create a positive, memorable experience, odds are you’ll develop loyal followers who will become your brand ambassadors. However, as in all things, the number one key is simpler. If you work at growing your social media platforms with deliberation, consistency and patience, you’ll do just fine. Recap: To optimize your content for search engines, you must do three things. One of the best ways to earn traffic is to improve your site’s search engine optimization. 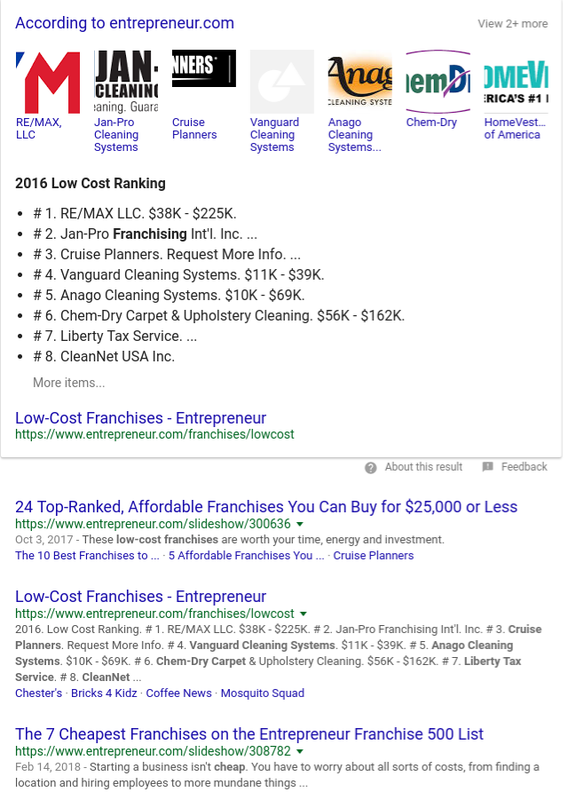 Ranking in the first page of a search engine results page (SERP) can bring literally millions of people to your website. You can then use that traffic to sell ads, write sponsored posts or even create a thriving online store. To optimize your content, you need to first understand that SEO starts with the construction of your website. Work with a developer or research what Google and other search engines expect from your website, then do what you can to make sure they get it. Focus on making your website as fast as you can. Over time, you should try to build up your authority on topics that are essential to your website. Next, you need to write a post that targets a specific keyword or search term. Make sure you use that keyword in the headline, as well as throughout the article. You should use related links and internal links that reference your website and inform Google what the article is about. At the same time, make sure you are writing something that informs the reader and doesn’t just target Google’s algorithm. Last, you need to create an online conversation about your piece through social media. Use partnerships as well as your own platforms to create a buzz around your website that even Google can’t ignore. If you can do those three things, you can create top-ranked articles and put the power of Google in the palm of your hand.